Monitor, Manage, Analyze and Prediction are important aspects in healthcare industry, we are sharing the case study on how big data can accomplish you needs. Big Data becomes the hottest term over the last few years and still wait to be explored its potential power to varies industries. In USA, the big data technologies are used to study claim and cost data, clinic data, Pharmaceutical data, as well as the Patient behavior and sentiment data, in order to capture the major opportunities of better medical service or Infectious disease prevention. Not only in USA, but also in mainland China, many healthcare institutes and hospitals have already cooperate with leading IT companies, like Huawei, to start big data pilot analytic and service. In this seminar, Huawei will discuss the update of big data technologies and the development of application in healthcare domain, especially in mainland China. They will show some pain points of regional healthcare and large-scale hospital, their data resource status and see how Huawei big data solution solve these problems and contribute a new innovational healthcare business. The speaker also will share his big data project about diabetes mellitus in a hospital in Shanghai. Jun Yan works on medical industry solutions for three years, and providing digital hospital, regional health platform, telemedicine, health management and other competitive medical solutions. And working on Hadoop-related product development and design in Huawei 3 years since 2008, with a strong technical background on big data, and engaged on data mining for diabetes experiments last year. Deadline for registration is 5 June 2015. Please email your full name, phone number,occupation and company name to info@ehealth.org.hk with email subject as Seminar RSVP? for a confirmation. 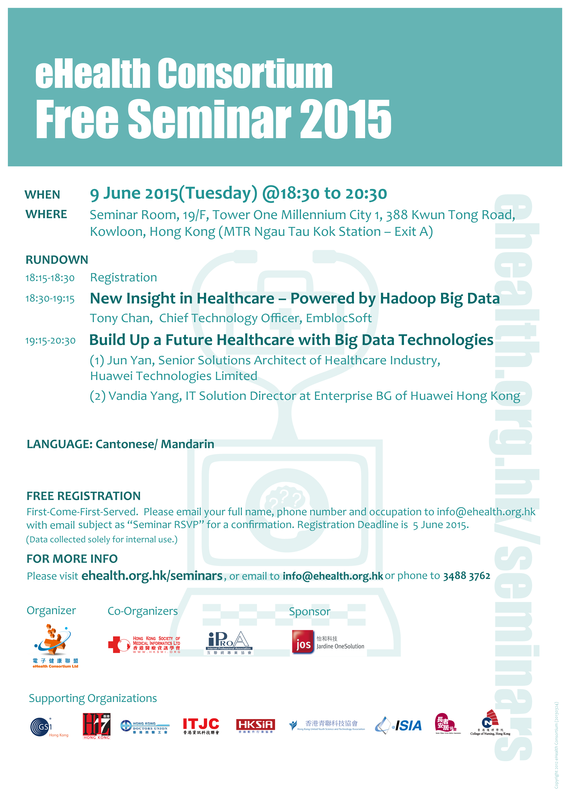 (Updated on 6 May 2015) Stay tuned for information on our next seminar!